And A Player To Be Named Later: Rivera For Cy Young? Interesting question posed to Tim Kurkjian this morning. 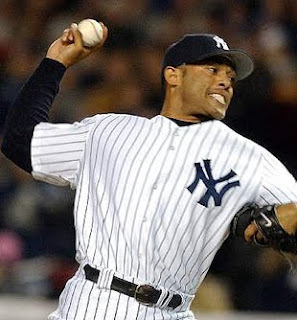 Does Mariano Rivera have a shot at the Cy Young? The short answer is no. Zack Grienke—unless he completely and utterly implodes—is getting it. He all but wrapped it up with the amazing start he had. That said; why isn't Rivera in the conversation? I know, I know. Relievers have "the most overrated job in baseball," blah, blah blah. And yes, that thought does trickle through to those who vote for the Cy Young. But it's not unheard of; Dennis Eckersly won it in 1992, Mark Davis won it in 1989, and Steve Bedrosian won it in 1987 (all of them with stats not as good as Rivera has right now). Add to that, the fact that Rivera got completely hosed in 2005 when voters gave the award to a completely undeserving Bartolo Colon over Rivera. Colon had a respectable 3.48 ERA and 122 ERA+ (neither of them his best numbers in those categories for his career). Rivera, on the other hand, had a 1.38 ERA and a preposterous 307 ERA+. Batters had a .177 BA on Rivera that season (compared to .254 for Colon.) Rivera didn't give up a run that year, from May 6th to July 8th, a span of 23 games. And this year, he might even be more dominating. Since June 16th, Rivera, in 29 innings, has given up 13 hits, 1 run and has 29 Ks. Opponents have hit in the neighborhood of .130 BA off him in that span and have batted .199 over the season. That number (BAA) drops to .167 with 2 outs and RISP. His WHIP is a ridiculous .898 (which, incidentally is not even the lowest of his career, both 2008 and 2005 are lower—of course he didn't win the Cy Young either of those seasons). His career WHIP of 1.0136 is the third lowest of all-time, and the two pitchers ahead of his last pitched when World War 1 was making headlines. Oh, and his lifetime adjusted ERA+ of 201 is the best....of all time. By 47 points. And we all know that the postseason is where Rivera makes his money. Of course that has no bearing in the Cy Young voting—but it's worth a mention here. In 117.1 innings pitched in the postseason, Rivera has given up 11 hits to the tune of a 0.77 ERA. His WHIP is .750. His so/BB is an insane 6.00. His lifetime SO/BB of 3.93 is 4th all-time. And he hasn't gotten the Cy Young for any of this. He is without question one of the three most dominant pitchers of his generation (Pedro Martinez and Greg Maddux —both of whom rightly received their awards), and each and every team in the league would gladly trade whomever the Yankees wanted for him, even at 39. His durability is remarkable; minor aches and pains aside, the man has been as consistent as the Northern, Southern and any other star you'd like. What else does Rivera have to do to get the reward he so obviously deserves? All of this is not to say that Grienke doesn’t deserve the award—he is a viable candidate. But as you can see, for as good as he has pitched, it really hasn’t helped his team all that much. Rivera, on the other hand, comes into a game in perilous situations, where his team hands him a game they can win—but need him to close for them. The pressure he pitches in makes 1 inning seem like 9. Tom Kelly once said of Rivera; "He needs to pitch in a higher league." Dennis Eckersley said Rivera is "The best ever, no doubt." Alex Rodriguez once said, "If my daughter's life depended on it, I'd want Mariano Rivera closing." What else is there to say? Also if he doesnt implode, I think Sabathia is a viable candidate too. Mariano isnt the only reliever who got jobbed out of a CYA. In 2006 Trevor Hoffman, who was a big reason the Padres clinched the West that year, lost out to Brandon Webb, who had only 16 wins. I think each year the voters are more and more reluctant to give it to a reliever. Look at your list it has been 17 years since the last time it happened. I've always been of the opinion that a dominating pitcher is a dominating pitcher. Didn't Gagne win a Cy Young? Yes, I think he did. You musn't forget the national league guys. Good point ABS. Hoffman should have gotten one at least once. And I thought the same thing Travis. It's been a generation since a reliever has gotten one. Holy moly, Eric. Totally missed Gagne. Great catch. before tonight's game, 21 of Mo's 44 appearances this year he came in with a lead of 3 or more. Almost all of those he pitched a full inning, a couple he actually pitched 1 and 1/3 innings, some 2/3. Call it roughly an inning per outing. So 21 of his 55 innings pitched he had the luxury of just throwing strikes, throw the cutter down the middle and let it move from there. I don't disagree that he remains the most dominant closer ever. His stats are unbelievable. He coulda/shoulda won at some point if relievers are eligible. I wish they weren't. Make an equally valuable award for closers (not fireman for most points through a contrived formula). Make it voted by peers or managers or something other than writers and fans. While a few times with the 3 run lead (or more) he got into trouble, the majority were boring scoreless innings he pitched. The nature of the position is such that your stats should be very good if you are a good closer. Well done Mo, but I gotta vote for a starter.